Okanagan College - Fun English - Summer Semester! But first, if you are looking to see some weird rituals of famous writers, check out this website on your own time! Lesson 1: Pre-Writing Activity - Let's Get the Creative Juices Going! 1. Welcome Students to Class. 2. Discuss today's Goal: Students will engage in a pre-writing visual activity to stimulate ideas for our upcoming paragraph assignment; also we will practice the skill of using vivid description and will practice identifying themes from a thematic image set. 3. Introduction: Hello students, by the end of today, if I’ve done my job correctly, we will all have written a stellar descriptive paragraph. 4. Please find a willing partner. First, we are going to start with a visual activity to get our minds thinking about the topic we will eventually be doing some writing about. 5. With one partner facing the LCD projector screen, and the other facing backwards, put your chairs next to each other so you can talk, but one partner can’t see the front screen. So you will be side by side, but also face to face. 6. We will be looking at an image set today. Each partner will get a turn. We’ll call them partner A and partner B. 8. We will look at an image, and “Partner A” will have to describe one of the two images on the screen in detail to the other partner who is facing away from the Screen. Explain what’s in the photo, what grabs your attention, try to be detailed and specific; what is the perspective? What is in the background and foreground? Use vocabulary that will help the other partner visualize the picture. “Partner A” will have one minute to do so. Then “Partner B” will turn around and look at the photo. "Partner B" will then offer one compliment on how "Partner A" described the scene. 9. Partner B and A will switch positions and repeat the activity. 10. As a class, we will usually do 2-3 turns. In order to try to determine a theme. 11. As a class, we will discuss what the message of the photo essay was; what do they all have in common. – Class discussion, while teacher writes down the salient points. 12. As the class we will discuss their personal views of what are other things that are great about living in Penticton. “The Joys of Living in Penticton” with an emphasis on vivid descriptions. 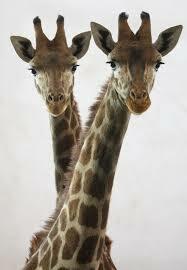 <-- That's right - don't get anxious about writing, after all we're just writing a "Pair of Giraffe." 14.Introduce upcoming writing assignment; explain how we will watch part of video to help remind us of all the things we can do in Penticton. So, while we watch the next small video, please be thinking in the back of your head, "How will I approach the topic and write about it." 17. Next Mini Activity is to make our own descriptive Letterman Top Five List of what the best things to do in Penticton are. Can be funny, or serious, but must be descriptive. We will eventually use some of these sentences in our paragraphs. 19. Students write 5 descriptive lines on “The Joys of Being in Penticton” following the Top ten Formula. 20. Have students write their "Hook" sentence / Topic sentence. Ie: "Whether it's the exuberant Ironman Challenge Contesting or the shimmering sunlight reflecting off of Okanagan Lake, Penticton is truly a place to Stay Forever." Instead of "Penticton is a joy to live in because..."
22. Finish the writing process. Partner read for errors and to add comments/suggestions. Edit and submit.